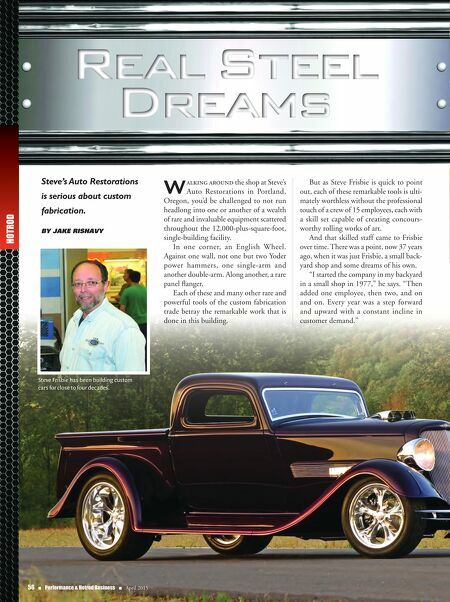 April 2015 n Performance & Hotrod Business n 57 In founding the company, Frisbie, then an aerospace worker, gradually employed all the skills and attention to detail he had honed working as a paint, plating, machin- ing and inspection man with Boeing, and in the process created a tremendous reputation in the antique and classic car business. An Evolution In the early days, Frisbie earned his reputation working almost exclusively with antiques and classic cars. Today, Steve's Auto Restorations offers services includ- ing fabrication and full custom builds on hot rods and custom cars as well. The company has performed com- plete stock restorations on 1930s Cadillacs, Packards, Delahayes, Daimlers, Locomobiles, Mercedes, Fords, Chevrolets, Corvettes and documented Cobras, among others. Along the way, Frisbie and the team also saw a lack of '33 and '34 roadster bod- ies suitable for restoration on the market and launched its own product line of new steel bodies and replacement sheet metal called Real Steel. (www.realsteel.com). The move into product manufacturing was an exciting step, says Frisbie. 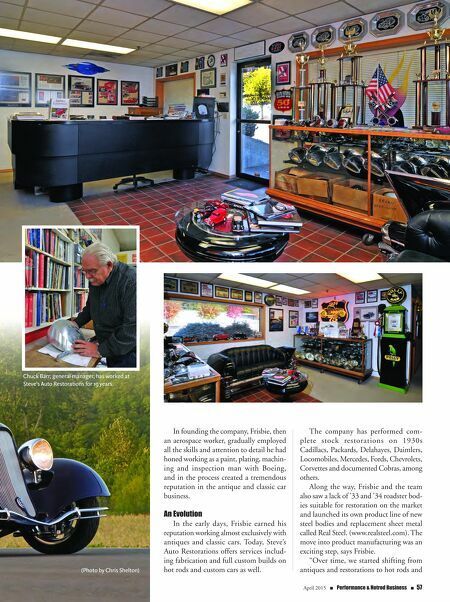 "Over time, we started shifting from antiques and restorations to hot rods and (Photo by Chris Shelton) Chuck Barr, general manager, has worked at Steve's Auto Restorations for 19 years.